Unimproved land in real estate is defined as land that does not have certain basic required services necessary to utilize it for other purposes. These include electricity, telephone, street access, or water available. When listed in multiple listing services, generally the absence of electricity and telephone will cause the property to be listed as unimproved, even though there is road or street service to it. 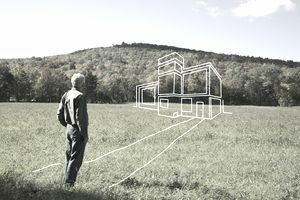 While the definition seems clear, there are different things potential buyers value in looking for raw land properties. Unimproved almost always means that there isn't an electric meter, phone box or natural gas meter on the property. However, that's a tight definition. How far away are those things? In many rural areas, there are a lot of unimproved land parcels listed. One very remote parcel was definitely unimproved by any definition. There wasn't even a public road into the property. Instead, a permit was acquired to use a U.S. Forest Service road and gate. There was no electricity, gas or phone anywhere within a reasonable distance to any of the property boundaries. How the property was listed was important, as listing it as unimproved definitely cut it out of all searches by people only wanting parcels with utilities at the property line. However, many times they were available within a few hundred yards and there were easements in place to allow them to be brought to the property line. There is often a field in the MLS for distance to utilities, which helps. It is best when doing MLS searches to include all land so as to not miss a property with potential just because it is listed as unimproved. Mistakes by listing agents usually involve not getting all of the information about the land. Also, there are at times survey mistakes. In one case, the wrong survey was attached to the listing for a 5-acre parcel. It was the prior survey of a much larger parcel out of which the one for sale was subdivided. The buyer got the right survey during the transaction process, but it was embarrassing for the agent. there were any squatters living there in an old bus. any signs you placed were still there and not shot full of holes. there wasn't illegal full-blown dumping going on. The owners are almost always out of state, and once they decide to list the property, they almost never visit it again. Squatters and Adverse Possession: in most states, someone can occupy land against the interests of the owner and without their knowledge and, after a specific period of time, actually take possession of the land legally. Any buyer wants to do a thorough inspection of all of the property to make sure there are no squatters. Can it be insured for title: in one market, there were large areas with dubious title history that could not get title insurance. Before even executing a contract it's a good idea to check with a title company with a legal description. How will you get utilities to the property line: if you ever want to use the land for more than weekend RV or tent camping, you'll at some point want to bring in utilities. Are there easements in place, or can you get them for the future? Unimproved doesn't necessarily mean no restrictions: Deed restrictions can be placed on a property, and they transfer with the land, almost impossible to remove. It doesn't mean that they are always adhered to, but they can be a problem. Unimproved land can be a great investment, but do your homework before a purchase. These days some research into possible previous use and environmental hazards may be appropriate. Some farms had old diesel tanks for tractor fuel, and some may be considered a hazard. What is Defeasible Fee in Real Estate?